Comparing both lenses on a Canon EOS 7D, we see a small advantage for the Canon EF-S 55-250mm f/4-5.6 IS II — a DxOMark score of 8, 2 points more than its predecessor. This difference doesn’t come from the resolution: with a score of 42lp/mm and 44 lp/mm, for the 2 lenses, the sharpness didn’t improve. The distortion and vignetting are also identical. But the transmission of the new model is on average 1/3 stop brighter. And the chromatic aberrations are better controlled in the corners at 55 mm. Very few improvements and no regression, so overall Canon maintains the quality of its kit telephoto zoom. 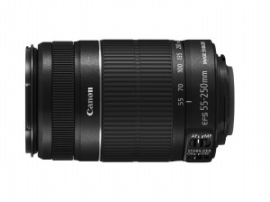 As a complement to the Canon EF-S 55-250mm IS II, this lens will enable amateur photographers to be prepared for most situations.